Give kids the big picture of God's story with this innovative, interactive Bible storybook. One hundred stories take readers on a journey through the Bible, and the digital pop-ups (accessed with a free "augmented reality" app) bring the art and story remarkably to life with both sound and 3-D imagery. 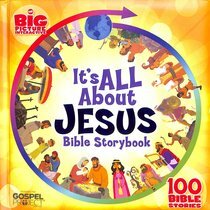 About "It's All About Jesus Bible Storybook"
Customer Reviews For "It's All About Jesus Bible Storybook"
Covers most main bible stories, with a couple of pages devoted to each. The text is quite small and detailed, which is difficult for younger independent readers. There are questions posed to the reader, which again are sometimes difficult for younger children. There is also a way to bring the illustrations to life with audio, if you download a Free Augmented Reality App. I have not tried this component so am not sure how effective it is.